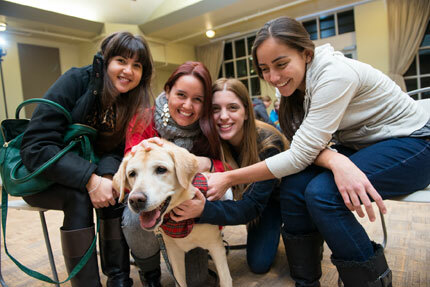 UNB students are putting their stress on pause with some friendly paws. Students on UNB campuses had the chance to take a break from studying by petting some furry faces this week. In Fredericton, students came to the end of semester De-Stress Fest Dog Room, which was held for two days in the Student Union Building Ballroom. Students on the Saint John campus cuddled up to some therapy dogs in the foyer of the Ward Chipman Library. The dogs were all volunteers from Saint John Ambulance and River Valley Obedience. This extremely popular event is a partnership between the UNB Health Centre, UNB Counselling Services and the UNB Student Union in Fredericton and UNBSJ Student Services in Saint John.